Check out Amy Reade’s latest book and pick up the ebook for only 99 cents. 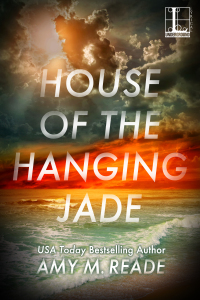 Friends, my third book, House of the Hanging Jade, is just 99¢! It’s also a Featured Ebook Recommendation today on BookBub. That’s an honor and a big deal for an author, and I’ve watched my sales numbers climb today as a result of the book’s exposure from BookBub. I hope you’ll consider sharing this with your friends and family and that you’ll reblog this post so we can get as many eyes as possible on the sale price and promotion. My pleasure. I do hope you get some new readers through it.